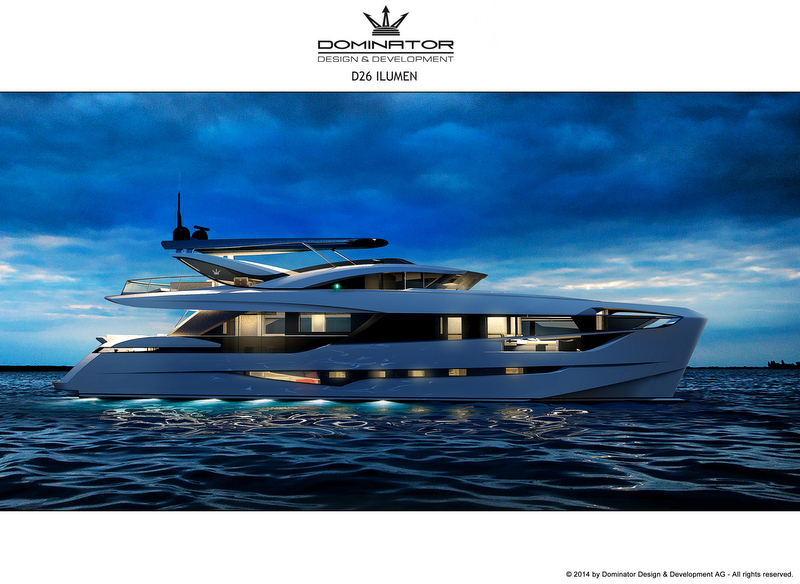 Dominator unveils D26 M ILUMEN Yacht at Cannes Yachting Festival – Superyachts News, Luxury Yachts, Charter & Yachts for Sale. The D26 yacht Ilumen really will be a yacht to experience all the senses. Other features will be a stern beach area directly on the sea, a fully equipped flybridge with Jacuzzi pool and bar station, the finest interiors customised to an owner’s needs (also unique in this segment), Not to forget the innovative propulsion system. It has often been said that the scope for individualisation afforded to Dominator customers can be likened to marine haute couture. It was therefore most fitting that an exclusively curated Julien Macdonald fashion show closed the evening in the finest style. Throughout the night guests enjoyed the glittering Dominator Ilumen signature drink and exclusive caviar bits while watching the brilliant visual and musical creations of the renowned DJ and VJ. Dominator loves to set new standards – not only in building tailored yachts but also in creating unique experiences.